The 'third place' is finally here. Starbucks has opened its first store in Mumbai. Spacious, the store sells coffee and blended beverages at 'moderate premium' prices, a li'l over what the big daddy of 'destination coffee' in India, Cafe Coffee Day charges. In India, the key test for Starbucks will come once consumers traipse into their stores. Consumers will assess Starbucks on three critical factors, namely, ambience, service, and of course taste. Its imperative that Starbucks scores on all three to have walk-ins hurry back. Meaning, the ambience must register and deliver on sophisticated comfort, the service encountered must have walk-ins feel welcome and at ease, and finally the coffee must taste like no other. There's one other thing Starbucks must do right. If by any chance they mess up on either service or coffee, they must recover quick enough to have consumers not leave with a grimace. Disappoint one, and the ripple effect will prove costly. Starbucks has done well to ally with the Tatas. Culture-wise they make perfect bedfellows. Both businesses are deeply respected, never mind the odd PR screw-up. 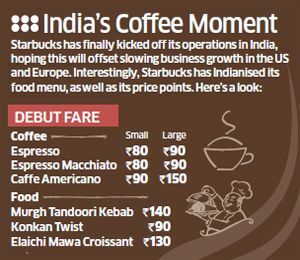 Here's hoping India bides well for Starbucks. Hi Prof.Ray Titus you have mentioned a good topic in your post,I thanks for it.You have chosen good topic for your post.Starbucks is branded name in a world.Everyperson in the whole world knows the brand of Starbucks.Starbucks is that organization which is famous for its services. With so many coffee franchises competing these days, you can't really afford to make too many mistakes. One too many goof-ups and you could easily be looking at a wasted investment.